Last week I had the great pleasure of discussing early results of a new Project Information Literacy  report that will be released in October. This time, Alison Head and her research team are looking at how college students consume news. Several folks met to talk about their findings and brainstorm what we think we should be doing to help students navigate this confusing information environment – not just librarians, but experts in media studies, journalism, education, quantitative social science, computer science, and civic engagement. Interdisciplinary conversations are so useful and far too rare. I’ve been reading a couple of books that are also entering this conversation for me as I wrestle with the problem of what free speech means in a networked environment. 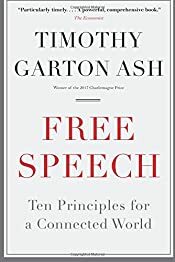 One is Timothy Garton Ash’s dauntingly long but thoroughly engaging Free Speech: Ten Principles for a Connected World . 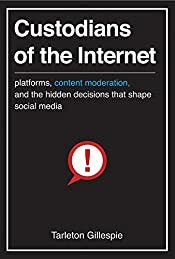 The other is Tarleton Gillespie’s Custodians of the Internet: Platforms, Content Moderation, and the Hidden Decisions that Shape Social Media . Ash (a journalist and academic) is a supporter of good old fashioned Enlightenment liberalism. He believes in universal human rights, specifically in everyone’s right to freedom to hold opinions and express them and to seek information regardless of frontiers – something spelled out in a UN covenant that most countries in the world have signed on to, but don’t necessarily uphold. All of this has become a bit more complicated in our networked world. He discusses the value of free speech and things that complicate it: the potential for some forms of speech to lead to violence, the complexity of developing a common sense of civil discourse in a diverse world, the importance of journalism, the need for privacy and the problem of secrecy, the complicated architecture of an international network that we rely on but don’t really understand. It’s a lively and ambitious defense of free speech that explores its complexities without losing faith in its basic universal value. Though it was published in 2016, the companion website  adds new content and presents it in many languages, something I've bookmarked as useful material for courses. He has recommendations, including that platforms radically rethink who works at these companies to avoid the groupthink that assumes a white, privileged, Californian mindset “where the notion of structural inequity is alien, and silencing tactics take cover behind a false faith in meritocracy. They tend to build tools ‘for all’ that continue, extend, and reify the inequities they overlook” (p. 202). He argues against "the economics of popularity" that amplify harassment, hate, and lies rather than newsworthiness or relevance. He also thinks the work of moderation, already labor shared through opaque flagging and reporting options, should be truly a shared effort, with users given a say in how moderation should work as well as tools and data to make the whole process more transparent. Free speech is important enough to care for it. These books shed some light on why its limits need to be carefully negotiated and defined and how, perhaps, we can do it better in future.